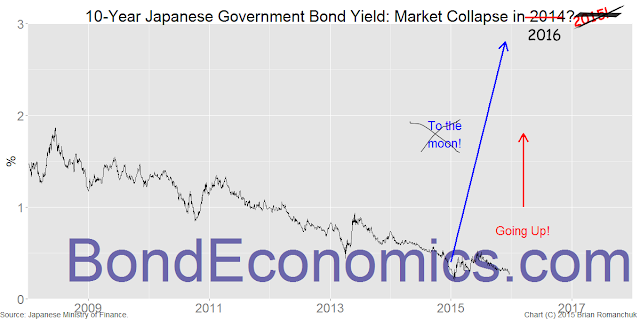 Bond Economics: Happy New Year! Happy New Year to all my readers! Unfortunately (but fortunately for the Japanese), Japanese hyperinflation and the utter collapse of the JGB market has been slightly delayed, but perhaps 2016 will finally be the year in which the JGB bears can say "I told you so!" Although the imminent demise of the JGB market ("any month now!") is one thing to watch for in 2016, a potential recession in the United States appears to be a slightly higher probability event to keep in mind. Stay tuned! bonne année à vous aussi... is this post about the imminent demise of the JGB market ironic? Or do you really see this event as a possibility? It's a running gag for my New Year's Eve posts; you can compare the chart to the previous years. At some point, Japanese yields will rise. However, whether I will still be around to see that happen is another question. With the current rate of climate change, whether any of us will be around to see it happen is the question. With BOJ's QE going strong, how can one foresee a rise in yields in JGB? You mention the "imminent" coming of hyperinflation, but for the moment, isn't Japan closer to deflation than inflation? What do you think would be the catalyst for hyperinflation? Understanding basic economics, Abe's massive QE should of sparked this, but this has failed thus far. One of the things I want to track are the calls for the imminent demise of the JGB market. Unfortunately for me, after Kyle Bass' predictions crashed and burned, it's not a popular call, even amongst the Austrians. So I have not been able to do a wrap up recently failed predictions every year, but I am still updating my JGB crash chart to keep the tradition going. Sooner or later, yields will slip higher, and the predictions of the imminent crash of the JGB market will once again be front page headlines, which will provide us with plenty of entertainment. Although I am not a big bear on JGBs, my instinct since I started this blog in late 2013 was that the ultra-low yields on 10-years was turning into a trap. (I am a "secular bull," but I still look at valuations.) Luckily for me, I don't give trade recommendations (and if I did, I would have to dig deeper). The BoJ is getting ridiculous. However, unless they get the policy rate down to -.50%, I doubt it will make much of a difference (other than the immediate headline shock). For Japanese investors, the potential gains/losses on foreign currency assets on a daily basis dwarf a 15 basis point annual carry.